First staged in 1952 the ‘Battle of Britain Air Display’, has taken place every year, with the exception of 1954. Alongside the air display itself the event also boast two major static displays of aircraft, one at Jersey Airport and the other in Lower West Park, St Helier, adjacent to the ‘main arena’ along Victoria Avenue, which for many spectators is the favoured vantage point and also boats a dedicated commentary courtesy of BBC Radio Jersey. In 1997 the event was re-branded and become the ‘Jersey International Air Display’, reflecting a move by the organisers to include a number of international aircraft alongside its traditional RAF participants. Along with the participation of many RAF aircraft the display now welcomes aircraft from further afield from as far afield as Sweden, Poland and Canada. 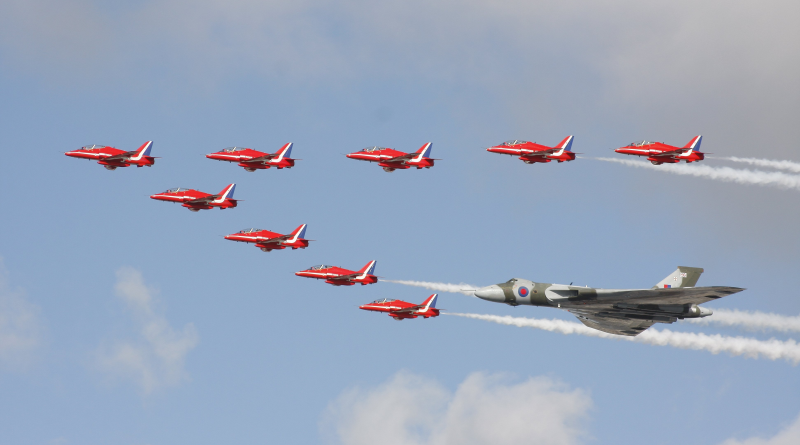 The annual air display is organised by the Jersey International Air Display a.r.l. a not-for-profit company, which strives to raise monies for British Service Charities and to support the Island’s tourism industry. As a result, organisers receive a grant from Jersey’s Economic Development Department, the government department responsible for tourism in Jersey and rely upon the generous support, financial and otherwise, of many leading businesses and individuals. Costs for staging an event of this size are increasing each year and as well as the expected costs for fuel and ground power, accommodation for aircraft crew and ground support also needs to be sourced. Organisers are always grateful for the generous donations, however small, it also receives from members of the public in acknowledgement of their enjoyment of this ‘free’ event.